Despite the damage caused by the Belo Monte Dam, the government of Pará approved a licence for the biggest gold mining project in the same region. Volta Grande is expected to be the biggest gold mine in Brazil. It will be located in Senador José Porfírio municipality, State of Pará (one of the most important hot spots of the Amazon Biome). This is the same region where the Belo Monte Dam has caused big social and environmental impacts. Volta Grande project comprises an open-pit, a gold recovery process facility, water and tailings management and supporting infrastructure. Is expected to extract 150 tons of gold in 17 years. On February 2017 the State Secretary of Environmental and Sustainability (SEMAS) approved the license to Belo Sun Mining Company (subsidiary of Belo Sun Mining Corporation part of Forbes & Manhattan Inc group). 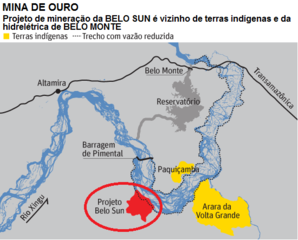 Belo Sun Mining is a Canada-based mineral exploration and development company with a portfolio of gold-focused properties in Brazil. The approval was made without consulting the local communities. The Environmental Impact Assessment (2012) concludes that all “the species found and the structures of the forest indicate that the remnants have already changed” and that the negative environmental effects will be almost invisible. Meanwhile the social impacts will grow. Local and traditional communities such as fishermen (ribeirinhos); artisanal miners (garimpeiros) and the indigenous complain against this project because of the future risk and future damage to the Xingú River. To extract the gold the company will use toxics such as cyanide will could impact the water of the river. Furthermore, this project will be only 11 km away from the Belo Monte Dam which will increase the environmental damage. But The Environmental Impact Assessment (EIA) provides no details regarding the interaction between both projects, neither their accumulative impact. To contain the toxic waste, the company plans to build a dam of 96 million cubic meters. 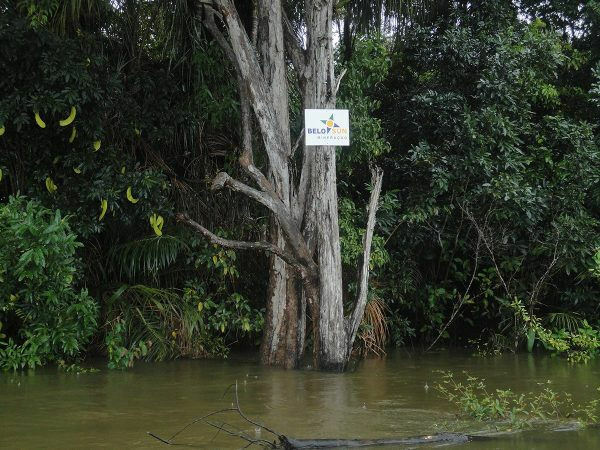 One of the engineers who prepared the report commissioned by Belo Sun certifying that the project is feasible and safe, is the same that signed the report that guaranteed the stability of the Fundão dam in Mariana (MG). (Which caused one enormous environmental disaster - 2015). Since 2013, a broad group of EJOS from Brazil, Canada, the United States and Europe joined a campaign in defense of indigenous and traditional communities threatened by Belo Sun. A public letter was signed by 44 organizations. On November, 2013, a Federal Judge in Altamira suspended Belo Sun’s environmental licensing process over questions surrounding the Environmental Impact Assessment’s validity and legality since it does not address potential effects on indigenous communities in the area. This was quickly appealed by the company and overturned. On December, 2013, the Environmental Council of the Pará State approved the EIA, granting the company it’s Preliminary License. It does not appear that the company made any changes to the EIA. On February 2017 the Ombudsman of Pará calls for suspension of the environmental license. Belo Sun is currently trying to attain the proper permits and licensing to build. Project Details -Estimated capacity to produce 50 tonnes of gold in 12 years of operation. -The project is expected to generate 2,100 direct jobs in the deployment phase, and 526 in the operational phase. -The project also provides for the construction of a tailings dam. International and Financial Institutions Forbes & Manhattan Inc from Canada - owner of Belo Sun Mining Co. Supporters: State of Pará Ombudsman (Defensor Publico), National Council of Human Rights; Amazon Watch;International Rivers. Other The EIA has identified archaeological findings in significant quantities. Development of Alternatives To continue with the traditional activities such as fishing, agriculture. Why? Explain briefly. Despite that the Federal Judge in Altamira suspended Belo Sun’s environmental licensing process, the company focuses on continuing with the exploration phase. Public Sign-on Letter: Belo Sun No!